The Sphero 3 LED Globe floor lamp has a gorgeous modern design that will look great in any room in your home or office. 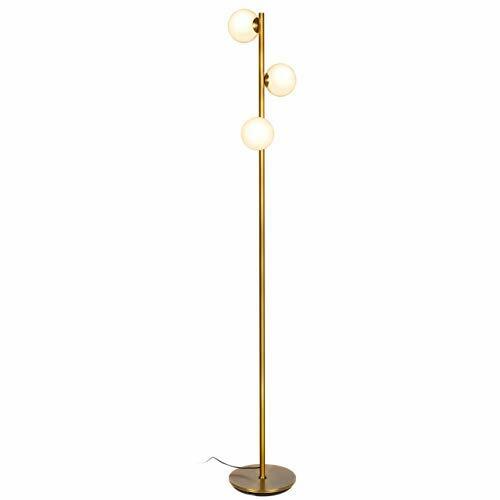 This unique floor lamp features three glass globe-shaped lamp heads that extend out laterally from the shiny brass pole. The Sphero 3's slender, lightweight design allows it fit into narrower spaces and it can easily be moved around to position the light where it is needed most. The built-in LEDs give off a golden glow that will bathe your space in warm, cozy lighting. The lamp operates with an easy to use on/off switch foot petal, and advanced LED technology that allows it stays cool to the touch. 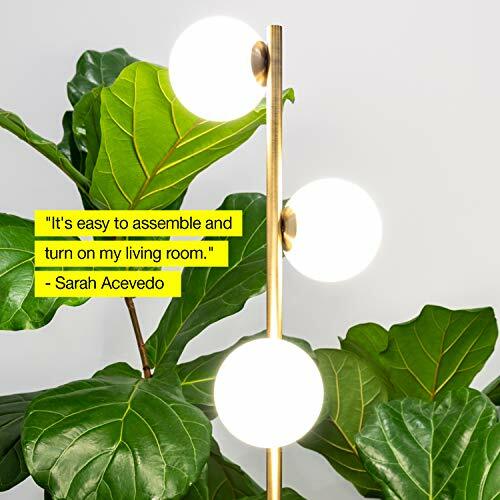 The unique and stylish design of this lamp combined with its many convenient features will make this lamp a conversation piece that your family, friends, and guests will love. For added benefit, the Sphero 3 LED Floor Lamp is compatible with wall switches and can also work with Alexa, Echo, Dot, Google Home, etc. When you plug it into a smart plug or smart outlet, you can turn you lamp on or off without having to leave your bed or chair! Assembly takes just minutes and no other tools are necessary! UNIQUE AND MODERN DESIGN: The Sphero 3 was designed to stand out and wow! The simple stem line and unembellished globes create a minimalistic look that goes well with Asian and modern décor schemes. The shiny gleam of the brass finish pairs beautifully with the frosted white diffusing glass shades to create a stunning look for your spaces. Its lightweight, slender design makes it very easy to move it from room to room, and it fit into narrower spaces, so you can use it wherever you need it. BEAUTIFUL WARM LIGHT FOR HOME & OFFICE; ECHO/ALEXA COMPATIBLE: This lamp gives off warm beautiful light that will create a cozy, comfortable, and well-lit space for any room in your home. An alternative to unpleasant overhead lights, the Sphero 3 provides lighting that is strong, but not harsh to enliven your indoor spaces. For added convenience, the lamp is wall switch and smart outlet compatible, and will also work with Alexa, Echo, when paired with a smart plug. STURDY & SAFE DESIGN WITH HEAVY BASE: Brightech designed this lamp with safety in mind. Its weighted base and sturdy design make it wobble free and safe to have around children and pets because it will not easily tip. This LED lamp will never overheat and stays cool to the touch. The convenient to use on/off pedal switch allows you to easily tap the lamp on or off with your foot. Brightech lamps are built to last and are the safest on the market! LONG LASTING & ENERGY SAVING INDOOR LIGHTS: The Sphero 3 LED Floor Lamp has an integrated 10 W LED light so that you will never have to replace a bulb. It's advanced 3,000K warm white LED technology allows this lamp to outshine lamps that depend on short lived, energy consuming halogen or incandescent bulbs. It will endure for more than 20 years without burning out or overheating. The lamp is also dimmable, for the most versatile possible use. (Please NOTE: heads are not controlled individually) SATISFACTION GUARANTEED WARRANTY: Our goal at Brightech is to provide creative, innovative, and beautiful lighting so that everyone can have quality, high end lighting in their home and office. We proudly stand behind all of our products 100%, which is why we offer a Full 3 Year Warranty. If for any reason you are not satisfied with your purchase, please contact us because our number one goal is customer satisfaction and we are committed to making it right for you.